A lot of attention is focused on the internet of things (IoT) and its industrial counterpart, the IIoT, but can businesses actually monetize and drive real business value from it? For companies with limited IT budgets and resources, finding that answer can be a challenge. One way to gauge the value of the IIoT to your business is to initially concentrate IIoT efforts on key performance areas such as asset uptime and maintenance optimization. These functions have used components of IIoT for years, if not decades, in the form of machine and process controllers and monitoring agents that acted largely independently. The IIoT allows such devices to communicate with each other. Industrial sensors, actuators, and PLC, SCADA, and DCS systems have long been very individualized, custom solutions with a rather narrow application. Simple functions such as tracking cycle counts or when a machine was on or off were possible, but the devices existed in isolation unless some software aggregated the data and provided basic information about operational efficiencies or when maintenance was needed. The modern technology landscape allows for greater automation, more data from a broader array of devices and sensors, and better ways of correlating and using the larger volume of information. With interconnected software and systems, Big Data analytics, machine learning and other IIoT components, concepts such as unattended operation and prescriptive maintenance become a reality, and new business opportunities open up. IIoT provides insight into the context of an asset’s performance, thus allowing for greater operational efficiency. It is not enough to know that an asset is operating at its intended load. Other factors such as the ambient temperature, humidity level, or excess vibration will influence how it performs. Collecting and correlating both operational and environmental data provides a clearer picture of the machine’s performance and maintenance requirements. Emerging technologies such as machine learning are helping to discover correlations that were otherwise difficult to see. 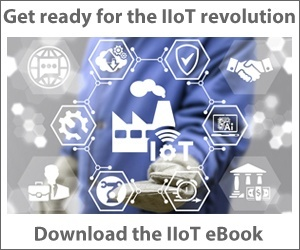 With IIoT, organizations can transition out of reactive mode and start predicting maintenance requirements and taking proactive corrective actions. “Prevention is always cheaper than cures and reaction. The more you can predict, and the more accurately you can predict, the better you can prevent an unplanned condition,” says Rick Veague, CTO at IFS North America. Transport operator Sporveien in Oslo, Norway, chose this approach when it equipped its trains with sensors that capture large amounts of data about their service needs, such as door rail bearings requiring lubrication, in order to enable flexible, predictive maintenance, lower costs, and more trains in operation. For certain assets, uptime and operational efficiency are improved when they are maintained based on real-life cycle counts. When machines run a lighter duty cycle than expected, the maintenance interval can be safely prolonged, which reduces maintenance costs. Conversely, higher duty cycles may necessitate increasing maintenance frequency to prevent costly unplanned downtime. IIoT allows EAM/CMMS solutions to process non-stop data from this equipment and trigger work orders at the right time and place. Location tracking, routing, and logistics optimization are simplified with IIoT connectivity. The movement of raw materials, spare parts, tools and fleets are optimized and costs are lowered when technologies such as sensors, controllers, GPS and RFID tracking devices communicate with one another. The IIoT enables system triggers and actionable intelligence, which then generate inventory and supply chain optimization possibilities. Concepts such as replenishment timing, economic order quantities, optimal inventory levels, and balancing supply with demand are more accurate and automated when there is visibility and connectivity across the entire value chain. The IIoT is a vital component of today’s digital factories, where production is far more automated and effective than in the past. For example, at Siemens’ Amberg Electronics Plant in Germany, the digital thread ties together all phases of the product lifecycle. Products communicate with production machines and IT systems control and optimize all processes. Production quality is at 99.99885% and the plant’s level of automation is 75%. IIoT with business process automation and workflow improvement. Energy efficiency and sustainability gains are possible with the integration of smart machines, smart monitoring, and smart environmental controls. Greater visibility into the assets, environment, and real-time data allows manufacturers and utilities to better analyze and control electricity, fuel and water consumption, and drive down costs accordingly. Similarly, IIoT presents opportunities for personal and environmental safety as well as physical security. Any breach of safety or security has far-reaching human, financial and reputational effects, not to mention potential regulatory penalties. A growing array of smart devices, equipment, and systems aim to mitigate such risks. For example, remote pipeline safety and integrity is improved when condition monitoring data collected by cellular networks provides early warning of leaks and pressure issues. New business and operating models and growth opportunities not previously envisioned become possible with the IIoT. For instance, remote monitoring of finished products affixed with sensors can reveal how the products are performing and when they will require service or replenishment. Michelin Group’s new fuel consumption reduction service and tires-as-a-service offerings use tires with sensors that collect usage and condition data combined with analytics to help truck fleets reduce fuel costs. Another example is General Electric’s jet aircraft engine maintenance business, born out of its jet engine manufacturing business, which is incorporating the IIoT in its move from scheduled to preventive maintenance and expansion into aircraft fleet optimization, a new market segment. Software, sensors, and controls running today’s facilities and equipment are outdated and difficult to upgrade. Companies cannot readily incorporate new features and improvements. Limited integration between internal systems (managerial apps, plant data sources) and external partners creates data silos. Aging operating systems and vulnerable operational technologies pose security risks because they cannot be easily retired or replaced. Limited embedded computing or intelligence control at the device, product, or plant level. Sensors, communications, and other operational technologies are working together with information technologies, most likely meshing in the cloud. Standard, fast software development techniques are used to create intelligent industrial products. A common data model and sensing and control architecture that supports the flow of insights and action throughout an organization and its ecosystem of partners. The IIoT infrastructure is trustworthy and resilient to inevitable compromise. While it is getting increasingly inexpensive to install the various devices and sensors and generate large volumes of data, there is still a need to distill it down to useful, actionable intelligence for the organization’s asset management system (EAM/CMMS) and end users. Therefore, enterprise-wide adoption of this capability has been slow. According to Accenture, only about one-third of companies (36 percent) have adopted big data analytics across the enterprise. More prevalent are initiatives in a single operations area (16 percent) or in multiple but disparate areas (47 percent). Organizations that are lagging in big data and IIoT implementation are already beginning to experience a competitive disadvantage. Of those who have begun exploring this technology, many are enjoying the benefits of more sophisticated analytics, though few have advanced to the level of prediction and optimization. To simplify adoption and accelerate the benefits, software and technology providers and systems integrators are working to pre-integrate and package IIoT solutions into a framework that allows for easier configuration and deployment. This includes, for example, the sensors, software, data, analytics, computing platform, and configuration required to automatically generate preventive maintenance work orders based on certain environmental conditions or cycle count thresholds. Veague believes that IIoT is very much an iterative process. “You start with small increments, not a shot to the moon. Once you have the basic flow of data and understand what you can know, the more it becomes clear what you want to know. As those ideas begin to flow, you can start to really drive the business value that you were expecting. It becomes a continuously developing solution for most customers,” he explains. It is unlikely there will ever be an out-of-the-box IIoT solution because the technology is continually evolving and every organization’s needs are different, but over time more solutions will be integrated and oriented towards business value and not just technology. This will enable more organizations to make the leap and embrace the potential of IIoT. In this installment of Automation Zone, we get ready for converged operations.